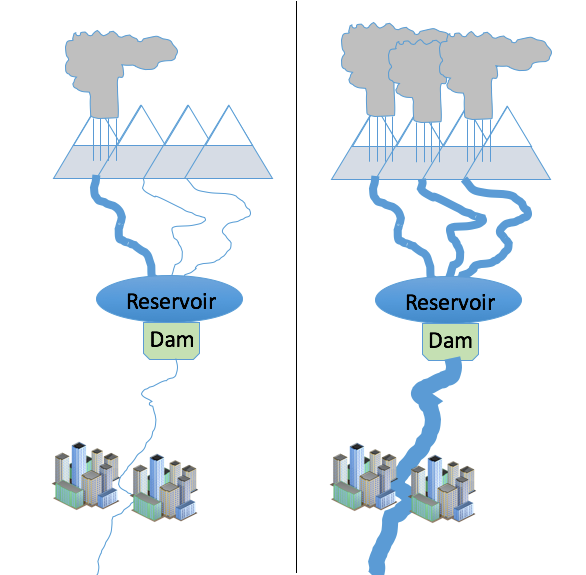 Decision makers use hydrological forecasts in a wide range of activities such as flood prevention, operation of hydropower facilities and water supply. The most important meteorological input into hydrological forecast systems are forecasts of precipitation amounts in river catchments. Global ensemble forecast systems provide precipitation forecasts several days ahead, but they come at a rather coarse resolution. Statistical correction (“post-processing”) can be used to obtain local-scale predictions from these large-scale forecasts. If these downscaled forecasts are to be used as inputs to a hydrologic forecast system, the statistical post-processing approach also needs to ensure that the resulting precipitation fields exhibit the same spatial patterns that we see on radar images. For example, it is important to know whether heavy precipitation will occur only locally, or whether heavy precipitation across several subbasins of a river catchment is expected (see figure). In a paper published in the Journal of Hydrometeorology, CIRES and NOAA researchers at the Physical Sciences Division studied the performance of existing post-processing methods to generate high-resolution precipitation forecasts with adequate spatial patterns. They illustrate some of their shortcomings and propose enhancements to overcome them. Existing methods for statistical downscaling of ensemble precipitation forecasts often produce precipitation fields that exhibit physically unrealistic spatial patterns. In the study, the researchers propose a few modifications to these methods that yield downscaled fields with improved statistical properties and spatial patterns that look more like those seen in analyzed precipitation fields or radar images. Hydrologic prediction system like the National Water Model require downscaled precipitation forecasts with the correct space and time structure as one of their inputs. Improving these inputs can result in improved streamflow predictions and in turn improve forecast guidance for water management. The researchers intend to continue this research and apply it in the framework of the National Blend of Models, a nationally consistent and skillful suite of calibrated forecast guidance. Authors of "Generating calibrated ensembles of physically realistic, high-resolution precipitation forecast fields based on GEFS model output" are: Michael Scheurer and Tom Hamill of the ESRL Physical Sciences Division.